Hamtaro! When we work together, it's much better. Hamtaro! We like sunflower seeds, krum krum krum. Hamtaro! Little hamsters, big adventures! ...No, there is no particular reason for me to own toys from an anime series marketed to prepubescent girls. Other than... It was on Cheez TV on weekdays, before Pokémon and Dragon Ball Z. Morning television was a necessary ritual for school kids of my era: you'd wake up roughly two hours before you had to head off to school, and get your awesome cartoon fixin's. Back in 1997, I opted for Agro's Cartoon Connection, and I can scarcely remember what I saw. There was this futuristic cartoon, with like, a princess, and a dinosaur henchman, and in one episode, the princess was trying to do the unexpected, and they worked together, and they said that they should team up in future, and the dinosaur was all 'don't find that to be... unexpected', and it was pretty badass. Year(s) went by, and Cheez TV became the channel of choice, overwhelming the competition with their arsenal of anime programs. The aforementioned Pokémon and Dragon Ball Z, they were mainstays. When kids got to school, they'd discuss what happened in DBZ with great excitement. It took us years to realise that these updates were only necessarily on a fortnightly basis, because most episodes were spent discussing prior transgressions, or a solid twenty minutes of screaming as someone powered up. I always wondered why the opponents never took that opportunity to attack. I mean, it seems like a particularly vulnerable moment, but instead they chose to stand there, grunting in disbelief. 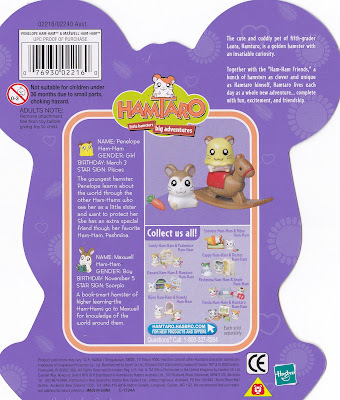 In 2004, a new challenger entered the fray, and it brought the greatest weapon of all: a bevy of cute, cuddly hamsters. ...Hamha! My favourite (I'm allowed to have a favourite) was the book-smart Ham-Ham, Maxwell. As you can see here, they were packaged as a set of two, as Maxwell shared his plastic abode with the youngest Ham-Ham, Penelope. There, have you gotten enough factoids? I've kept that bit of cardboard for no apparent reason for the last seven years, and it's finally served a purpose. It can die a happy manboard. At the time, I did of course realise that I was not the intended demographic for these toys. If the source content wasn't enough to tip me off, perhaps the fact that most of the packs were in settings of luncheon dates and slumber parties did. But I cared not. For Maxwell was thuggin' and buggin', and he came equipped with a rocking horse, a carrot, and a small baby. It was like the contents of a crack house, it was awesome. When I first opened them up, I was met with a dilemma. I really had nothing to do with them. I wasn't really playing with toys anymore in 2004, but that didn't stop me from still buying them every now and then. 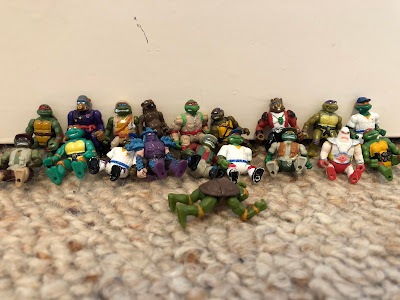 Hence, I had the set of Ninja Turtles from the series revival, and on the other end of the spectrum, the duo of Maxwell and Penelope. Two different worlds, most assuredly. I tried to get Leonardo to ride the rocking horse, and he was most unaccommodating. Frankly, the Ham-Hams don't really do anything. Their playtime sessions are quite akin to an old English comedy; lots of witty dialogue, with very little in the way of action. They're basically model replicas of their on-screen equivalents, other than the enormous holes in their bottom, allowing them to mount the rocking horse in a fashion akin to the vehicle Mr. Garrison invents in season five of South Park. My intention is to pass these on to my young niece. She's old enough not to put things in her mouth, so I don't have to worry about her swallowing the carrot. And even if she does, it'll probably be okay, because carrots are supposed to be healthy.